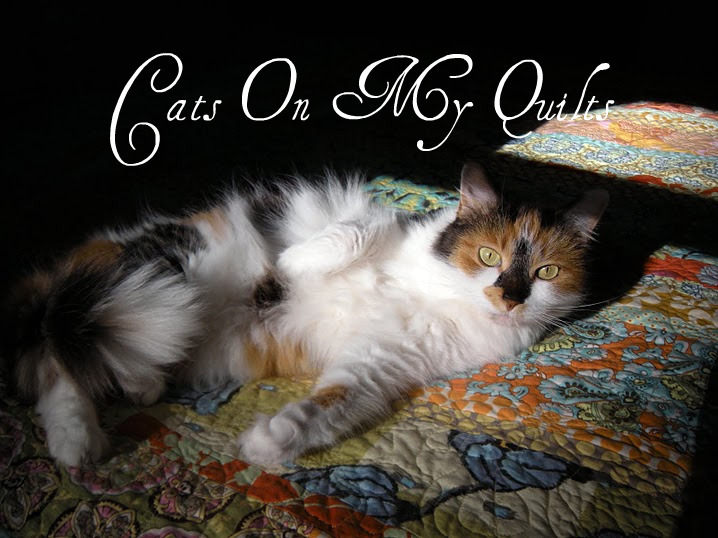 Cats On My Quilts: Well, Looky Here!! I had a pile of Amy Butler fabric which I was trying to put in to a quilt which I wrote about in my last post. It was really giving me fits. All the colors and patterns were a little over whelming to me. But then as I was reading the comments on that post there was one from sewmeow who said, Sometimes us quilters just need to "do it" (as Nike shoes ads used to say) instead of "thinking of doing it".......good luck. And that was what I was doing-"thinking of doing it". So I just trusted my instincts and did it and this is what I came up with for color and pattern placements. I just love the colors, especially all the turquoises and oranges. The pattern is by Valori Wells and is just fantastic in her new fabric line but I am on a fabric diet so into the stash I went. You can find this free pattern here. And believe it or not, I already have this quilt back from my quilter who did a fantastic job. I would have shown you a picture of the quilting but it is so dark and rainy here today that the pictures just wouldn't come out. Seriously people, it has rained 18 of the past 23 days here in NH! Good days for staying in the sewing room. Sewmeow was right -- I love the way it worked out! Hope the rain lets up soon! It is beautiful!! Don't fret, it has rained here too. But then again, I am not far from you. love when I can use up my stash as well! 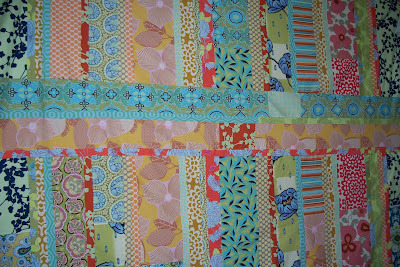 great quilt to snuggle up in on those rainy days... we have a week more of rain coming so prepare! It is so pretty, so glad it worked out. 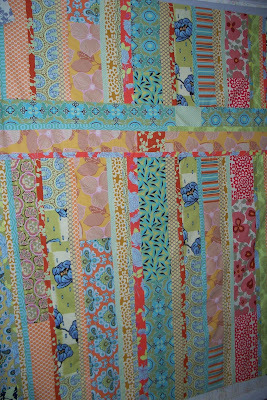 Although I'm not a fan of Amy Butler fabrics (color me old-fashioned) I love the way this is turning out. That Sewmeow is a pretty smart cookie. Rainy days get me down when they go on and on. When it's just a day here or there I appreciate the time indoors. It's a pretty, pretty project. 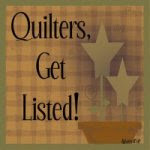 Aren't quilters helpful folks? There's always someone with helpful advice, just the right words, gentle encouragement--glad that Sewmeow was there to give you that little shove. It's a beauty! Too bad you didn't make this 10 years ago...it would've been an awesome quilt for your daughter's room. Not so much for the nursery though! How totally neat. What a qreat array of fabrics. Love it. Fun. And I'm so darn happy you're just sewing away. Summer is great! I agree, it is beautiful!! Oh my gosh, that is so beautiful! I love the way all the fabrics work together. Quit came out great. Love the colors. Somtimes I think we tend to over think things and should just take the plunge. Good advice from Sewmeow. Its rainy here too. Wow you did have a 'few" of her prints huh!! Good job! great selection and you captured all the prints perfectly with their mates so they flowed together. Just lovely! Those are not fabric's I would have picked because I would have been afraid of what to do with them, but seeing what you did, wow, simply beautiful. you have a great eye for color! !